Acquired: Acquired: In person, 3/1/14 Talons Season Ticket Party, 2014 Talons versus Sharks. 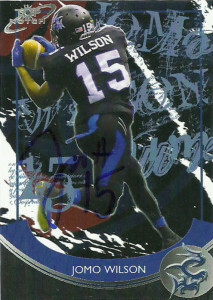 At Eastern Oregon, Jomo Wilson caught 61 passes for 869 yards and 8 TDs in 19 games. 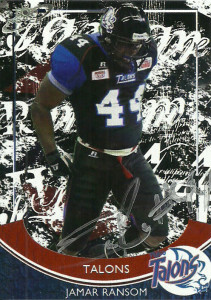 After graduating Jomo played in the AFL2 for the Central California Coyotes in 2007 and the Idaho Burn in 2009. An offseason workout partner of Aaron Garcia, Garcia lobbied hard to get Wilson a tryout with the Sharks after Jomo was cut by the Rush. It paid off, as not only would Jomo become a member of the squad, he’d go on to record 81 catches for 964 yards and 19 touchdowns along with 60 kick returns for 862 yards and 3 touchdowns in 2010. In 2011, he’d have his best year to date with 131 receptions for 1,737 yards and 44 touchdowns. 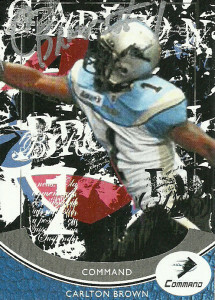 Jomo signed with the San Antonio Talons where he continued to step it up as a #1 receiver/ returner for the team. In 2012, he had 83 receptions, 1,284 yards, and 36 TDs and 26 kick returns for 537 yards and 3 touchdowns. In 2013 Wilson followed up his first season with 1,206 yards on 98 catches and another 24 touchdowns. Jomo was the last of the Talons I was looking for at the season ticket holders party. 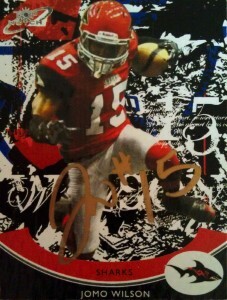 He snuck behind the ground that I was talking to in the back before I finally cornered him to sign his card. He liked the look of the Sharks card but was hoping it was a Talons one instead. Still even though I wasn’t able to get Rohan Davey (rehabbing) or ‘Tank’ Cook (taking a season off for fatherhood) like I had hoped, it was nice to get all the receivers I wanted. 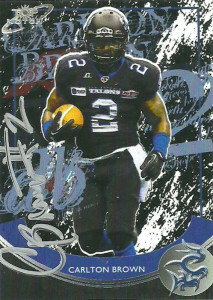 Ironically during the 2014 season, Jomo found himself traded back to the Jacksonville Sharks by the San Antonio Talons for ‘future considerations’. 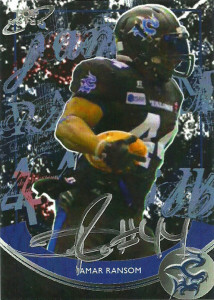 He signed this card before the game against the Talons. Having our seats upgraded to near the front row, I was in Wilson’s ear hole all day, but he still burned the Talons’ secondary for 2 or 3 TDs. I think once or twice during the game he winked at me before he scored.